For the last few months I have been considering individual motivations which is pretty tricky as people are motivated by many different things, however I have made an attempt to develop a simple model that does seem to reflect the IT related motivations I see in many people. Initialy a person is motivated to get access to a computer and software that is reliable and has good connectivity. Until they achieve this they achieve this they are unlikely to worry too much about anything else. Once they get access to a reliable computer they will seek to maximise their personal productivity, which will often express itself as a desire to control their IT environment, customising it, installing additional software, and generally making investment decisions that match their personal priorities. For example Joe’s priority might be a high end laptop with Office Professional and Firefox whilst Emma might want a desktop with 2 large TFT screens and be happy with Star Office provided she can have Adobe Photoshop. Even though Joe and Emma have very different desires they may in fact do the same job, but being different personalities with different skills and work styles the environments that for them deliver maximum productivity are very different. Once Joe and Emma have control over their environments their priority will start to turn to control over their personal voice, ie how their contribution is seen by their managers and peers and other stakeholders. 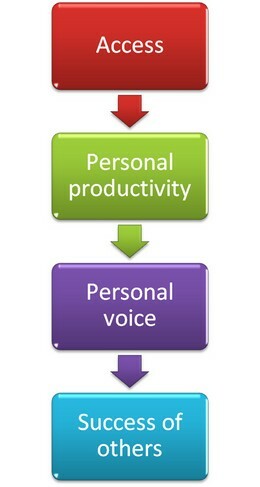 Personal voice has been pretty difficult to achieve and I believe that lack of achievement of this need has stalled many IT projects that relied on people working together effectively as teams. Enterprise Blogs and related technologies seem to me to be a great way for people to express their personal voice and I think their popularity on the Internet reflects a lot of frustration within the enterprise. Once people feel they have control over their personal voice, their priorities will switch to the success of others, or to the teams of which they are members. Of course these steps will not be true for everybody nor are the steps binary, ie they actually just reflect the fact that people will be dissatisfied if they are asked to focus on higher layers before their needs at the lower layers are pretty well served. By now of course most people will probably have figured out that what I am describing is closely related to Maslow’s hierarchy of needs, but I am not a psychologist so I am not really qualified to do any analysis at this level. I just wanted to share my simple observations. 2. Inside the grounds as an occasional visitor. 4. Being on the pitch. How you contribute depends on where you are. We expect people to contribute as a team player when they aren’t even in the grounds yet. Tags:No TagsIBM have recently started to publicise the forthcoming 7.0.2 Notes/Domino point upgrade and emphasise the new features in terms of an out of the box blog template.